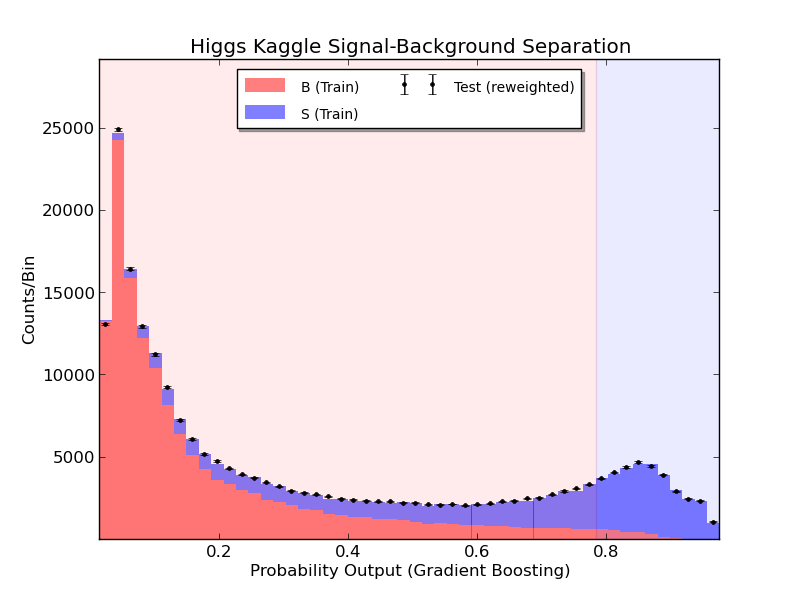 This post is intended as a quick-start guide to getting a competitive score in the Higgs Boson Machine Learning Challenge, using just a bit of python and scikit-learn. The data consists of just a training.csv and test.csv file. Each of these has a column of ID numbers and 30 columns of feature quantities. Each row represents an event which is either a signal higgs event (s) or a background event (b). The training.csv indicates the truth value (s or b) as well as an event weight. The goal of this challenge is to classify the events as signal in a manner that optimizes a certain metric. The metric for this challenge is the AMS metric, which is a function of the weighted numbers of correctly and incorrectly guessed signal events. My approach is pretty simple. I am using the gradient boosting classifier, and I am using the probability output for each event to rank the events. I don’t take the classification at face value – I make a cutoff on the probability prediction and call the upper 15% of events as signal. You can optimize this threshold to maximize the AMS, but after a few tests I have found that the upper 15% is usually about right. I divide the training sample, keeping 90% as training, and 10% as validation. I calculate the AMS on both to check for overtraining. To check that the results look reasonable, I also plot the probability prediction. The red is training background, and the blue is training signal. The black dots are the testing data, normalized to the training sample. I haven’t applied any event weights, because we don’t know these in the test data. The blue shaded region is the upper 15% which I call signal to maximize the AMS metric. The probability prediction for training signal and background, as well as on testing data, based on the gradient boosting classifier. Without further ado, this is the code. It should predict in AMS of about 3.47, and the submission scored about 3.38 (either due to random fluctuation or a tiny bit of overtraining). It runs in 5 minutes for me. I am using sklearn 0.14.1 and python 2.7.3. # Pick a random seed for reproducible results. Choose wisely! # Experience shows me that choosing the top 15% as signal gives a good AMS score. # This can be optimized though! # Scale the weights according to the r cutoff. bin_centers = ( bin_edges[:-1] + bin_edges[1:]  ) /2.